A jury duty policy outlines rules for employees to request time off from work when they’ve been summoned to serve on a jury. Your jury duty policy keeps you informed of when employees have been requested to serve and allow you to specify what documents you need. It also explains how they’ll be compensated for time off work. We recommend using an all-in-one human resources, benefits and payroll software like Gusto, to help track time off requests for jury duty, store your jury duty policy and calculate payroll properly for employees who are serving on jury duty. 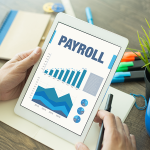 Great payroll software makes managing your business easier. Click here to try Gusto free for one month. Our free sample jury duty policy is based on best practices and allows you and your employees to remain compliant with jury service requirements. 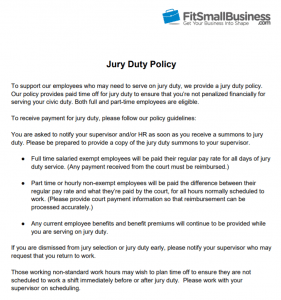 You can download and customize this sample jury duty policy to suit your business’s needs. It covers how employees should request time off for jury duty, what documentation you need from them and if and how the employee will be paid while on jury duty. Some states like California provide a jury duty policy template directly on their website that you may wish to use instead. The law is pretty clear about what you need to do as an employer when your employees are summoned for jury duty. You must allow them to go, and you may be required to pay them for time away from the job. However, you have rights as an employer as well. In addition to federal court jury duty requirements, many states have specific rules for both the employee summoned to jury duty and that person’s employer. The Employment Law Handbook provides a state-by-state listing of jury duty laws. Unless your business is in one of the states that require you pay your exempt staff, you may not be required to pay employees while they’re out on jury duty. However, 68 percent of employers supplement the wages paid by the court up to the employees’ full pay even while they’re serving a day out of the office for juror selection or are assigned to multiple days on a court case. There’s no federal law that requires you to pay employees who are out on jury duty, but there are several states that require employers to pay their salaried-exempt employees. Typically, the court will pay just slightly above minimum wage for each hour your employee serves on jury duty. To support the community, many employers offset the wage gap by paying the employee the difference between what he or she earned on jury duty and what the employee is normally paid per hour. A best practice is to pay your employees their regular wages or salary while they’re out on jury duty. However, in turn, request that they reimburse you for the exact amount they received as juror pay in exchange. That way, you’re covering them for the hours missed and they’re reimbursing you, at least in part. Paying exempt employees their regular salary allows you to take the burden of jury duty off the employees from a payroll standpoint. You can ask employees to return to the office on any day they’re called but not selected for jury duty. This is the best option for the employee so he or she doesn’t lose out on earnings when called for jury selection. However, it’s costly for the employer as you’re paying wages but getting no work in return. You can offset their salary by requesting them to reimburse you any earnings paid to them by the court. For example, Julian works full time as your network administrator making $2,000 a week. While serving a week’s worth of jury duty, he earns $600 from the court. You pay his regular salary of $2,000 but are reimbursed $600 by Julian to help offset your payroll expense. Julian signs the court check over to you as reimbursement. Allow an employee to take paid time off (PTO). The employee receives regular pay as a PTO day, plus a little extra pay from the court and doesn’t have to return to the office if the jury duty commitment ends early. Of course, the employee may not want to use PTO for this purpose, and you cannot mandate that he or she does so in many states. However, if the employee does, he or she essentially receives double pay, and it doesn’t cost you anything extra than paying out the PTO you’ve already allowed the employee to accrue. You could have the employee show you the earnings he or she received from the court and, as an employee benefit, pay the employee the hourly difference between what the court paid him or her, along with his or her normal pay. This method is the best approach for compensating hourly workers who serve jury duty. For example, let’s say that your hourly employee is called for jury duty in Sacramento, California, which pays $15 per hour. He or she serves three days of jury duty. If the regular rate of pay is for your employee is $18 per hour, and the employee normally works eight hours a day, you could pay the difference for the three days. The court will pay jurors, but it’s not likely to be at the same pay rate you pay them. However, in some cases, it’s better. Let’s say you pay your restaurant hostesses $10 per hour, and they receive $14 per hour on jury duty. You wouldn’t need to pay them anything to offset their earnings as they’d be making more doing jury duty than being at your restaurant greeting patrons. You’d instead give them unpaid time off for jury duty. There are many valid reasons for employees to postpone jury duty but not to get out of it entirely. For example, a manager scheduled to speak at a national conference may not be able to attend jury duty on a specific date. He or she can ask the court for a new date or postponement, using the procedures provided in the jury summons received from the court. 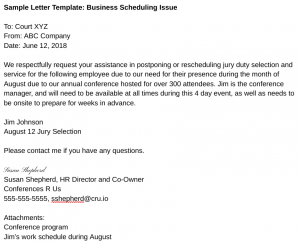 We’ve provided two sample letters to help you request a judge postpone or reschedule jury duty for your employee based on business needs. However, it’s possible a letter won’t be needed as some court summons’ documents provide valid reasons to postpone jury duty and allow the individual to request rescheduling online. It’s important to coach your employee to follow the instructions in the court summons. Here are sample letters you can download and modify. You may also want your employees to be aware of valid personal reasons they can use to get out of jury duty, such as if they have a surgery scheduled, are unable to find childcare or have a mental or physical condition that may exempt them from serving. 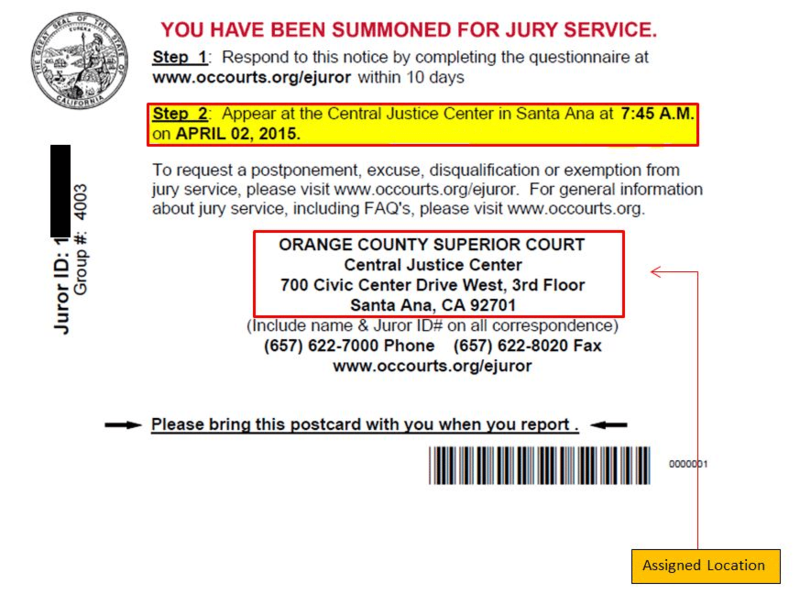 What Document Should Employees Provide to Let Me Know They’ve Been Summoned to Jury Duty? We suggest you ask for a copy of the summons which shows the employee name and date. You could also request any payment information if you are reimbursing the employee for time taken off for jury duty. 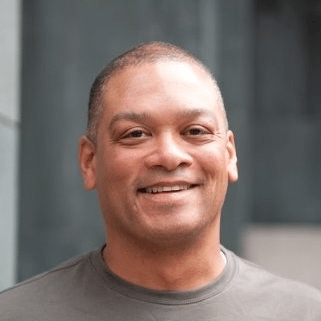 HR/benefits company Zenefits, provides additional insight on documents to request on its blog. What Does a Jury Duty Summons Look Like So I Know it’s Real? Each court is different and summons documents vary greatly. Some will be as small as a postcard like the one shown below. Others will look like a legal court document. If you’re not sure that the summons document presented by your employee is legitimate, you can go to the court’s website or call the phone number provided. The court clerk should be able to verify your employee’s summons and answer your questions as an employer. What If an Employee Who Normally Works Nights is Summoned for Jury Duty? You might consider giving the employee the night off prior to their jury duty so he or she is well rested. Alternatively, you could give the employee the night off on any day that jury duty has been served so the employee is not overly tired. In fact, requirements like these are spelled out in some states like Tennessee and Connecticut. Is There a Limit as to How Long I Should Pay an Employee Who is on Jury Duty? 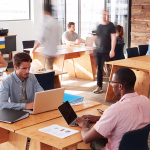 Individual courts may set guidelines but, in general, if you’re a small business, you’re probably not going to be able to give up a full-time employee for several months and continue to pay that person. Therefore, you may want your policy to limit the amount of time the employee can serve on a jury with pay. This is another situation where employees, upon jury selection, may want to state that they can serve on a short-term case but, due to the business hardship to their employer, they are unable to serve on a case that goes on for more than say, two weeks or longer. Of course, check the court guidelines to ensure your policy doesn’t violate jury duty requirements in your location. Where Can I Find Information on My State and City Jury Duty Rules? Most of the time, the jury duty summons will provide a website address where you can find the state and local court rules for the employee being summoned as well as for the employer. You can also do an Internet search for jury duty in your state and city. Look specifically for employer information like whether you’re required to pay the employee for jury duty or not. It’s our duty as citizens to support our court system by serving on juries and allowing our employees time off work to do so. However, a jury summons may not come at the most opportune time. Therefore, it’s important to have a jury duty policy so that your employees notify you if they are summoned to jury selection. That gives you time to discern whether there’s a valid business reason to ask them to postpone their jury duty service. To help manage your employee policies like jury duty, employee handbook and time-off payments for when employees are on jury duty, consider working with an all-in-one HR, benefits and payroll software like Gusto. Gusto can store these documents electronically and provide labor law, payroll and tax compliance for you. Click here to try Gusto free for one month.